It is time for our Wine and Food Pairing Weekend, hosted this month by yours truly. Yep, that's right, I was in charge of the theme for this month's #WinePW. I chose Spring Flavors. I explain why I chose this theme in my introduction post. I was excited to have so many people want to join in and attend my party. I wrote about that in my preview post. Then I got to work deciding what Spring Flavors I would create and what Wine I should choose to serve with my meal. 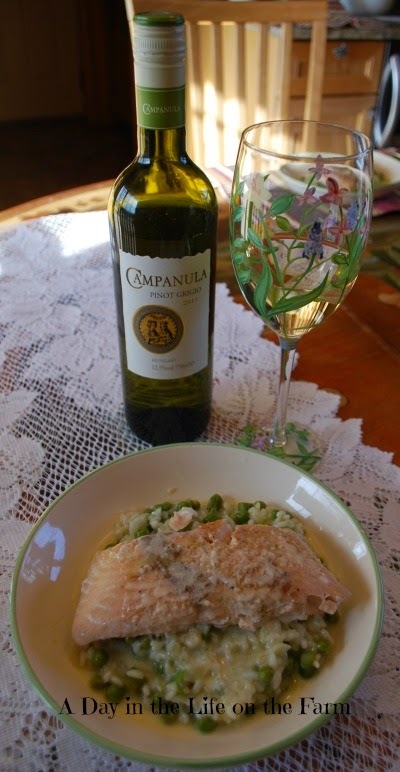 I chose to make a Spring Vegetable Risotto topped with Salmon with White Wine Sauce. Spring flavors are difficult for me to pair with wines. Asparagus, especially, causes me problems but I find that if I meld all the flavors together into one dish it helps with the decision of which wine I will serve for dinner. We had been gifted a bottle of 2011 Companula Pinot Grigio from Hungary. I had never tried this bottle before but I was familiar with Pinot Grigio which is normally a wine associated with Italy. A good rule of thumb is to serve wines and food from the same regions so I thought a Pinot Grigio would pair well with the risotto. It was not a great pairing but it was a decent pairing. I think the risotto could have used a heavier wine. This bottle of Pinot Grigio was light and acidic with flavors of green apples. We did eat all of our dinner and drink the entire bottle of wine along with it so I can't call it a failure but I can see where a heavier wine, perhaps a buttery Chardonnay, would have been better suited to the richness of the risotto. Just take a look at what this wonderful group has planned to meet my challenge to them. We may never find ourselves in this dilemma again!! 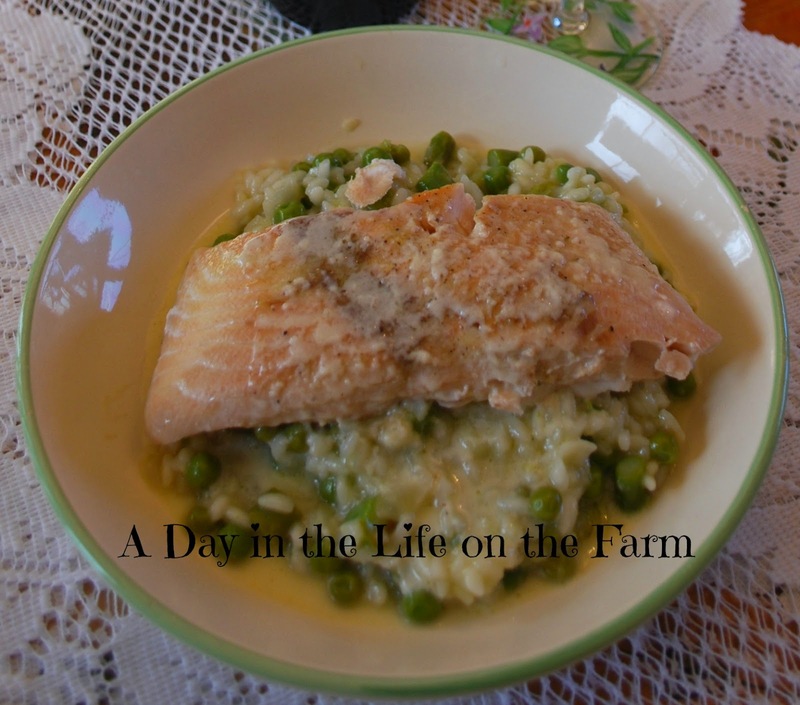 I love salmon dishes and like the pairing with a spring type risotto. I always gravitate towards mushrooms. I love mushrooms as well Jennifer. The great thing about risotto is that it can stand up to whatever additions you want. Great minds think alike! I love that you topped your risotto with salmon. Thanks for hosting this month! Thanks Sarah. I had a good time. I love risotto...it's so flexible. Thanks for hosting this month, Wendy. What a great theme! Thanks Cam and thanks for all your help with my first hosting experience! Your dish has my mouth watering! The wine sounds very interesting: a Pinot Grigio for Hungary, I like it! Thank you for a great theme and hosting. Sorry I missed the chat! Thanks Michelle, I missed a good portion of the chat myself. I was watching my grandbaby and she wasn't cooperating for part of it. Delightful pairing Wendy. I've had dry Furmint from Hungary, but never Pinot Grigio. An empty bottle is always a good indication of quality! Cheers. Thanks Nancy. This was the first wine I have ever had from Hungary. What an interesting wine pairing. I have not had a Pinot Grigio from Hungary. Dish sounds great. I had never had any wine from Hungary prior to receiving this bottle as a gift. It was light and acidic. I've not had Hungarian Pinot Grigio - sounds intriguing. What I love about this group is learning so much about food, pairings, and sometimes they aren't what we expected. I've had a few lately where the wines were fine, but not the best pairing too. Cheers! I am enjoying this group very much Christy and I am glad I joined. My horizons are expanding each day.